Reports are coming in of various problems and errors on the Birds Faststamps. 1. Anybody who decided to wait for the Stampex crowds to die down and try Tudor Street (ex Ludgate Circus) instead on the morning of Friday 17th, would have found a well-known dealer installed with several assistants preparing first day covers with machine-vended stamps. This was a clever move as this is an unmanned kiosk so there was nobody in attendance to control any monopolising of the machine. But when the first roll was exhausted (1500 labels dispensed in batches of 99!) a phone call to the PO was necessary to get the new roll installed. Apparently only 1 of 4 machines had the birds, the others had the Machin labels. 2. At Cambridge (as at Norwich) only one machine had the birds stamps, but the postmaster put another roll in the second machine when requested, so that the collector concerned could obtain the bird stamps with both machine codes. Full marks also to Cambridge who had machine-vended sets at the counter to save customers queueing. 3. The bird stamps were installed in both machines at the City of London (Eastcheap) PO but only one had been converted to the new font. Alert collectors were able to obtain both versions, those with the old font displaying overlapping details on the bottom row. 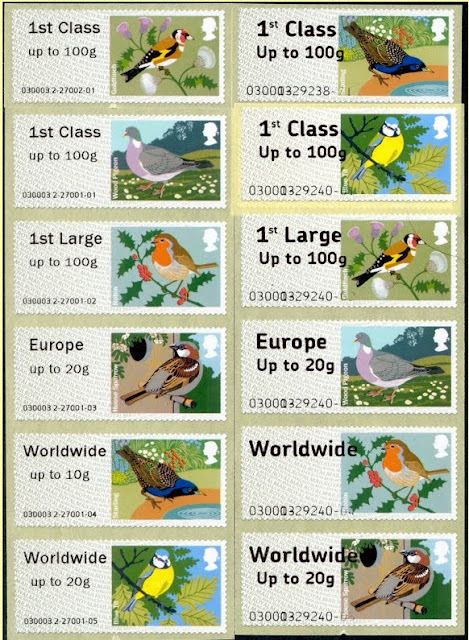 Note also that the 10gr Worldwide stamp is totally missing the 10gr (see the Robin stamp). 4. According to an eBay listing, the first few labels dispensed by machine #1 at Liverpool had a wide gap in the data in the bottom row, resulting in the session number and stamp number overlapping the bird image. Apparently this only lasted for a short time before the machine was adjusted. Short phosphor bands, starting 3mm down from the top, are also reported from Liverpool machine #1. 5. Addition: another eBay listing shows one of apparently only 10 strips with a different font error, also from the Liverpool machine, on the Machin head Faststamps the day before the birds were sold. Everything is correct except the Up to 10g part of the Service Indicator on the Worldwide 10 stamp. The receipt demonstrates that the strip was generated as shown, all from the same session. 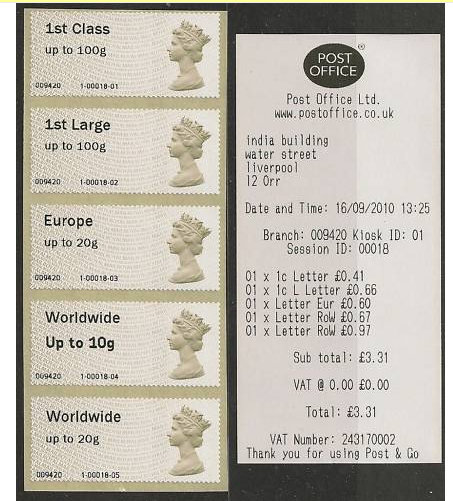 The error must have arisen because the W10 stamp is produced from the 'Post an Item' menu, rather than the 'Buy Stamps' menu. Have you bought the new Faststamps locally? Have you found any errors? ?